Some of the best exhibits in my car brochure collection. Nostalgia is a huge part of what makes owning a classic car fun. Driving an old vehicle is like operating a time machine; it creates a very tangible connection to the past. 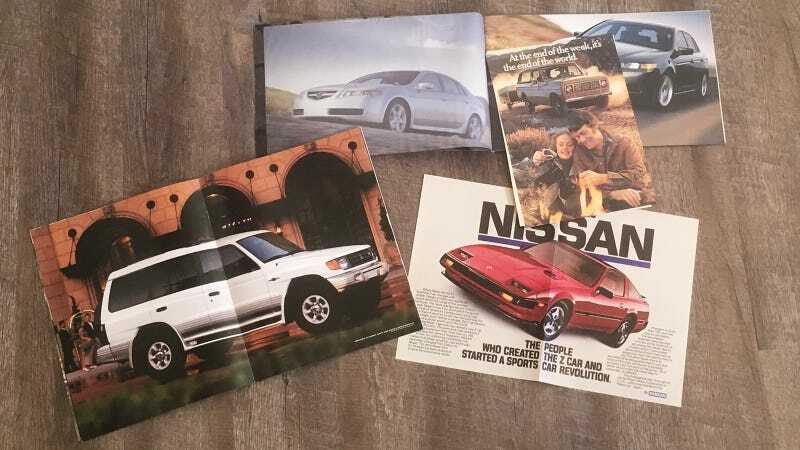 Studying old car print ads and literature is similarly satisfying, and gives us some context to better appreciate these cars with. I feel like collecting vintage car brochures, and particularly displaying them along with a car at car shows, which I totally do, represents a level of nerdiness I should probably be ashamed of. But to hell with it–I’m very proud of my library of period-correct automotive print ads that go with all the cars I own. I’m sure I’m not the only one with this fascination either, because plenty of websites exist selling these things. At this point I really only gather old automotive paperwork about cars I own, but if I expand my search parameters, I’m pretty sure I would quickly drown in stacks of smelly old documents. My fascination with old car ads kicked off when I was a kid. At the end of the 1990s, my grandfather had a Packard Bell computer, which I logged dozens of hours playing SkiFree and MegaRace on. One day he introduced me to eBay, which he was using to indulge his own obsession with tiny models of old ships. “Can you buy car stuff on here?” I asked innocently, not knowing the expansive market that lay before me. In 2019, many of you reading this have probably spent thousands of dollars buying car parts and memorabilia online. But 20-odd years ago, it was nothing less than mind-blowing to a tween geek like myself. Opa let me put “DeLorean” in the search bar. Yeah, guess who had just watched Back To The Future for the first time? The only thing I remember finding was a DeLorean dealership brochure. It was a glossy folded piece of paper with some heavy contrast photos and a cutaway drawing, just like the ones in Road & Track reviews which I also loved. For a hot second, I thought this document was the coolest thing ever. I asked my grandfather to bid on it for me. I think I gave him like four bucks. He let me believe I had lost the auction, but ended up surprising me with an envelope from Orange, Calif. a few days later–the brochure was inside. At the time, I didn’t really appreciate it as a historical artifact. It was just a neat picture of a cool car. But even as a child I was oddly preservationist, and more than two decades later, not only do I still have that DeLorean brochure in perfect condition, I actually keep it in the cardboard envelope some guy from Orange sent it to my gramps in New York in. C’mon America. “That looks so ’70s,” I say in my head every time I look at this. And my dad has a bike that looks just like that, which his dad bought new in ’77, if you’re wondering why the heck I would have collected a Honda Express brochure. These little time capsules you can hold in your hand are really fun to look at, and there also a great source for specifications and such which can be tough to pin down when it comes to old random cars. But mainly I just like the pictures. ...seem similarly quintessential of their respective eras to me, and they only get more fun to study as they age. My 2004 Acura TL brochure isn’t quite ripe yet, though. I guess that’s too-recent past to be nostalgic for because the pictures just look like pictures, as opposed to a study on a bygone era. For now it’s just cool to help me imagine my own car in prime condition, but eventually cars from the mid-’00s will be just as interesting to enthusiasts as ’90s hardware is right now. Actually, you know what? I already am nostalgic for a time when Acura sold a legitimate sport compact car and multiple manual-shift luxury sedans. I know I’m hardly the first person to appreciate vintage car brochures and old ads. In fact, I’m really looking forward to seeing other ones that people share in the comments here. But I did recently realize that these brochures are more interesting than just photographs of old cars because of the context they add. The clothing, the copy, even the typefaces helps put the old cars we love in perspective. And I think that unlocks another level of appreciation for the vehicles themselves.